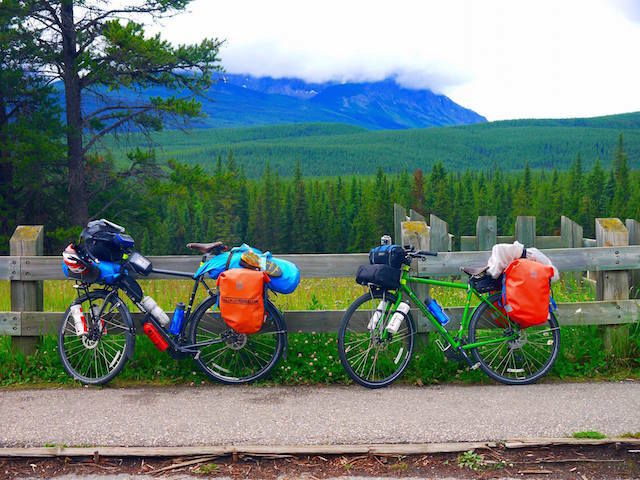 This gear list will be updated regularly during our cycle trips (sorry, we’re not that organised to have pretty photos to include in the post – but we’re working on it). Michael is also working on some gear reviews to add to this section. Watch this space! 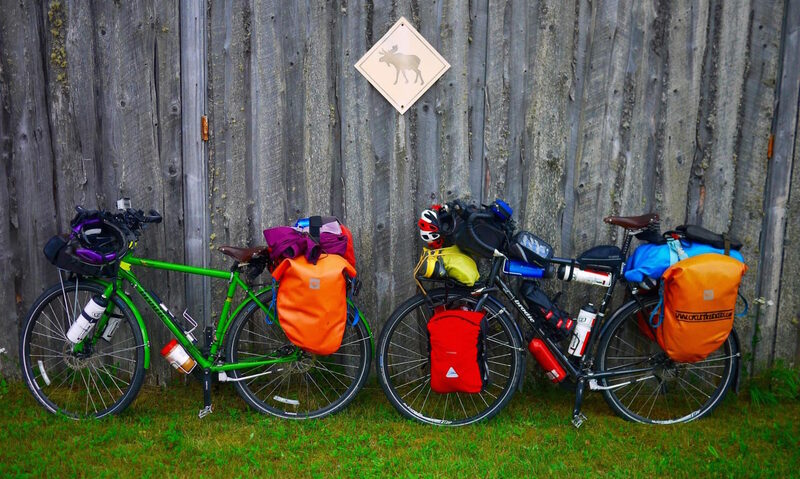 We stuck with our Brodie Circuits (2016 & 2015) that we cycled across Canada with. They got a bit of a tune up over our break, but that’s about it (Gear Review). MEC panniers aquanot roll top 20l pannier. Soma front pannier rack (on Kelly’s bike). Blackburn FL1 low rider rack (on Kelly’s bike). Topeak compact handlebar bag (on Michael’s bike). Cateye volt 400 front light (on Michael’s bike). 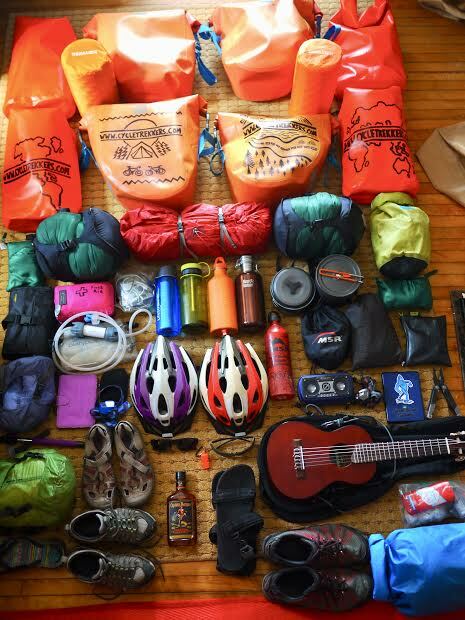 Gear photo for our 2017 leg – yes, that’s a bottle of rum! Toiletries (plus multi-sink plug and biodegradable soap flakes). Clothes in Compression Bags, plus several dry bags. Norco Search S3 (2015) chromoly frame cyclocross/touring bike. Kelly’s new bike! This bike is a total beast and should handle awesomely well on and off road with disc brakes and 30 speeds to choose from when climbing gigantic mountains! Brodie Circuit (2016). Kelly’s second bike of the trip (after day 2 she decided the Norco wasn’t up for cycle touring and exchanged it for a Brodie). Brodie Circuit (2015). 4120 Chromoly frame touring bike. Michael’s new baby! Classic style touring bike with bar end shifters and disc brakes. We are both yet to ride these bikes as they are waiting patiently for us to pick them up in Canada and ride them around the world! Filzer PR-2 rear pannier rack for the 2015 Brodie, the 2016 Brodie came with a fitted rear pannier rack. Cateye volt 400 front light. Solar charger and power banks (Panasonic power bank). First aid kit and a lot of drugs. Toiletries (plus, multi-sink plug, washing line, soap flakes). As you can probably tell from this gear list, we were on quite a strict budget at the time. Since then we’ve upgraded a lot of this gear. Trek T30 Navigator bicycles (bought second hand): Cheap, second-hand, sturdy, but we loved them, and we had absolutely minimal problems with them. The worst thing that happened was a couple of punctures, a couple of blown tyres and a broken screw in the back rack. These bikes are solid! Unfortunately, we decided to sell them in Urumqi, China for $50, and I think we’re both regretting that decision now. Home made handle bar bag: Made out of a 6-pack cooler bag. The bikes came with racks and fenders. Surly Ogre, awesome mountain bike style touring bike or Trek 520 classic touring bike. Sounds like you got all the supplies you’ll need – best of luck on your upcoming journey!